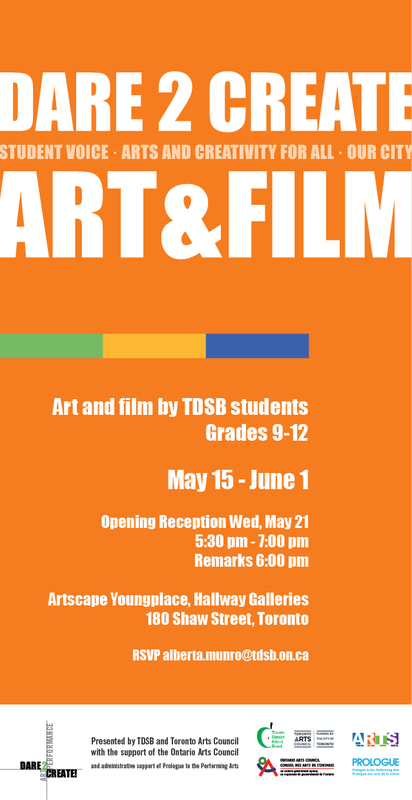 This exhibition is the culminating celebration of a project that is co-presented by the TDSB and the Toronto Arts Council. Students from over 30 secondary schools submitted proposals for collaborative art projects based on the theme of identity and their connections to the people, places, histories and happenings of the City of Toronto. The proposals were reviewed by a jury of Toronto artists, and the work that is showing was selected for development and exhibition. These senior level Art students were mentored throughout the process by their teachers and by local artists. The work is supported by video statements created by the students about their work. Please join us at the opening, 5pm – 7pm, May 21. Remarks by students, project supporters and David Liss of MOCCA at 6 pm.